Home » Photo Gallery » Newdelhi:23/7/18; Dharmendra Pradhan, Minister of Petroleum & Natural Gas and Skill Development & Entrepreneurship at the Inauguration Ceremony of Hydrocarbon Sector Skill Council Office. 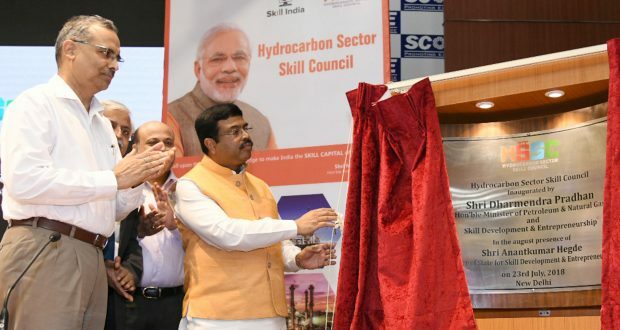 The Union Minister for Petroleum & Natural Gas and Skill Development & Entrepreneurship, Shri Dharmendra Pradhan inaugurate the office of the Hydro Carbon Sector Skill Council, in New Delhi on July 23, 2018. Newdelhi:23/7/18; Dharmendra Pradhan, Minister of Petroleum & Natural Gas and Skill Development & Entrepreneurship at the Inauguration Ceremony of Hydrocarbon Sector Skill Council Office.